Last week we gave you a few suggestions on where to take your visiting family and friends during the holiday season in downtown Los Angeles. Today we look 23 miles south to downtown Long Beach and the waterfront. Downtown Long Beach is easily accessible from the north by the Metro Blue Line and the area hosts family-worthy attractions all within walking or a free shuttle’s distance from the four Metro stops in the area. Long Beach Transit runs frequent bus service in the area and their free Passport shuttle service will take you and your guests to just about every attraction in the downtown and waterfront area. As one of nation’s most bike friendly communities, Long Beach is also a great place to get on a two-wheeler and ride around. Pine Avenue in downtown Long Beach. Visitor Information Center in downtown Long Beach. Long Beach Transit Passport free shuttle. 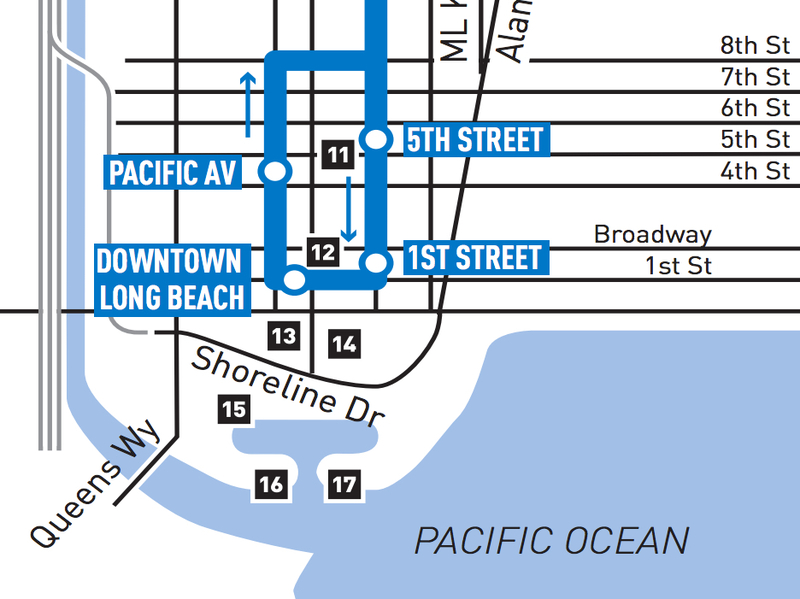 Downtown Long Beach Blue Line loop. Take the Metro Blue Line and exit the Downtown Long Beach Station. If you have any questions or issues once arriving in Long Beach, a conveniently located Long Beach Travel and Information Center is located across Pine Avenue from the station. From the station you can walk just a few minutes south or take the Long Beach Transit Passport bus for free at the corner of Pine and Ocean — a temporary stop due to construction (see the temporary map here) — to the Aquarium of the Pacific, where Metro riders save $2 on adult admission and $1 on child admission. Assuming you didn’t spend the entire day at the aquarium (it’s possible), you can hop on the free Passport bus that stops at the entrance and head across the bay to the venerable HMS Queen Mary. The Queen Mary features fun tours like the Ghosts & Legends as well as The Glory Days historical tour of the ship. During the holidays, attractions include snow tubing and ice skating and holiday-themed events. If you or your travel companions get hungry and can’t wait for the bus for the trip back downtown, check out the Promenade Cafe for something to eat. It’s located in the Queen Mary with great views of Long Beach. Or you can also take the Passport bus back to downtown and grab some grub at The Federal Bar where Metro riders receive 10 percent off food — show your TAP card for the discount. If you’re craving some casual and affordable seafood before you had back home (it is the waterfront after all) check out the seafood at Pier 76 Fish Grill, located right next to the downtown Long Beach station. They also have other menu options for the land-lovers in your group. If neither catch your interest, take a walk north down Pine Avenue to see if any of any of the dozens of restaurants catch your eye, or take a right on Broadway for another delicious seafood option at The Big Catch Seafood. When you’re good and full, just head back down to Pine to the Downtown Long Beach Station. TRIP PLAN 2: Bike it! As one of the most bike-friendly cities in the United States, there are plenty of resources and trip ideas in Long Beach for the short-distance and long-distance bikers in your family. If you already read the trip plan above, it can also be easily completed on a bicycle instead of walking or Passport Shuttle and a majority of it is along a dedicated bike path. There are a number of places you can rent bikes in downtown Long Beach, but the most user friendly might be BikeStation located on 1st Street just down the street from the Downtown Long Beach Station. They offer a variety of services for bicyclists such as storage and maintenance, but as a visitor, they’re an excellent spot to rent a bike for the day. Rates start at $8 per hour or $32 per day, or if you have three or more people the rates drop to $5 per hour or $20 per day. Once you have your bike, you can tour around downtown (for a a handy map of bike routes downtown and suggested routes for sightseers, click here) or you can venture out along the Beach Bike Path about 10 minutes to the Long Beach Museum of Art. The museum is open Thursday through Sunday with free admission on Fridays. It’s also home to a lunch cafe with great views of the waterfront. If you’re still looking to burn some energy after browsing the museum, you can keep going down the bike path past Belmont Pier and then head another 15 minutes east to the shops and restaurants of Belmont Shore along 2nd Street. 2nd street is incredibly bike friendly and contains colored bike sharrows. If biking made you hungry, check out Open Sesame for some Mediterranean food or if you need a good sugar rush to get you back to downtown, try Frosted Cupcakery. Here’s the official website showcasing what the neighborhood has to offer. Last, if you still have time or the energy, the Belmont neighborhood is located next to Alamitos Bay and across from Naples Island, a good setting for a casual bike ride along the water. Though none of the streets other than 2nd Street have bike lanes, most side streets are narrow and encourage relatively slow traffic and during the summer months, the bay-adjacent Bay Shore Avenue is closed off to car traffic for most of the day. When you’re ready to call it a day, take the bike path back to downtown Long Beach to return your bikes — the entire trek should only take about 20 minutes. The Bikestation shop is about equidistant to both the Downtown Long Beach or 1st Street Station to catch your ride back on the Blue Line. Know Long Beach and have more suggestions? Let us and other readers know in the comments! Note: The Metro Blue Line is currently undergoing improvements. All four downtown Long Beach stations will be open during the holiday season, but if you’re planning a trip at a later time, please check the latest construction notices here. I have been to Long Beach plenty of times over the last decade. They have some very interesting tourist and restaurants in the city also some very nice hotels in the downtown area. But, as far as shopping is concerned; I feel Long Beach has a lack of it in their downtown area. What used used to be a nice mall where Buffums was originally located; has turned in to a mess. People can do better by shopping in Downtown LA or other areas. Some of you may not agree with me; but this is how I personally feel.